Nemo 33 is the deepest indoor swimming pool in the World. The pool is located in Brussels, Belgium. Its maximum depth is 34.5 metres (113 ft). It contains 2.5 million litres of non-chlorinated, highly filtered spring water maintained at 30 °C (86 °F) and holds several simulated underwater caves at the 10 metres (33 ft) depth level. There are numerous underwater windows that allow outside visitors to look into the pools at various depths. The complex was designed by Belgian diving expert John Beernaerts as a multi-purpose diving instruction, recreational, and film production facility, 2004. Here's the our members favorite photos of "Pools in Flemish Region". 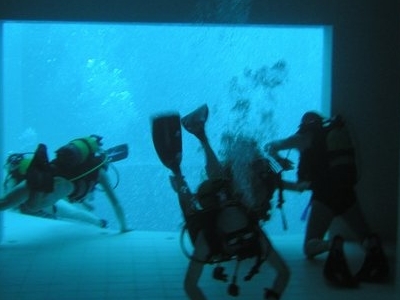 Upload your photo of Nemo 33!